Because of Hungary’s continental climate the end of August, beginning of September is still summer weather in Hungary. The average temperature is 25-35 degrees centigrade, while 15-25 degrees centigrade during the night. Humidity is rather low, however rainy days may occur. The official national currency is the Hungarian Forint (HUF), which is convertible. The exchange rates applied in Budapest banks, official exchange offices and hotels may vary. All the major credit cards (VISA, EC/MC, American Express, Diners) are accepted in Hungary in places displaying their emblems at the entrance. The current exchange rate issued by the Hungarian National Bank today is 1 Euro = 1 HUF. It changes on daily basis. Lunches, dinners and refreshments are included in the registration fee. The Registration Desk, where advanced and on-site registrants may pick up their congress material is operating at the Department of Transplantation and Surgery of the Semmelweis University. PowerPoint or PDF presentations are accepted on USB memory sticks. Speakers are required to drop of their presentations at least 2 hours before their scheduled presentation time. If the presentation is scheduled early in the morning, we kindly ask the speakers to upload one day before. We kindly ask the speakers to keep the time limits given. 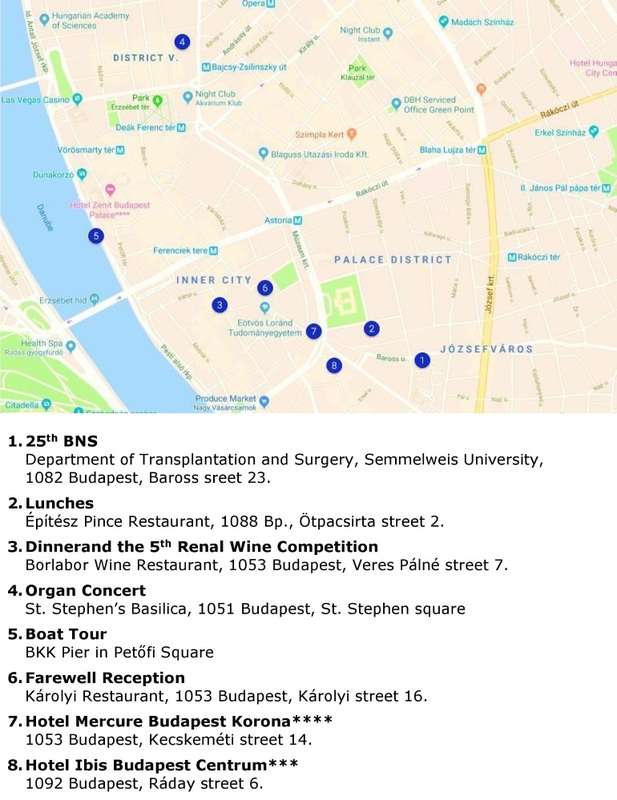 Please note that the 26th Budapest Nephrology School is a good occasion to discuss your scientific results and/or difficult cases with the international faculty and participants by presenting a poster. The size of the poster is: 90 cm wide and 120 cm high. There are several flight connections from all over the world. Budapest Liszt Ferenc International Airport is situated approx. 45 minutes from the City Center. Please be aware of exposing yourself at risk by using non-regulated taxi service providers soliciting at the terminal buildings. Metropolitan bus Nr. 200E leaves from terminal building to Kőbánya-Kispest station where you may take metro line M3 (blue line) to Kálvin tér. Metropolitan bus Nr. 200E leaves from terminal building to Kőbánya-Kispest station, where you may take metro line Nr. 3 (blue line) to Kálvin tér. Metropolitan bus Nr. 100E leaves from terminal building to the city cMetropolitan enter with stop at Kálvin tér (fare: 900 HUF/person, approx. 3 EUR). The Department of Transplantation and Surgery, Semmelweis University is situated approx. 20 kms from Budapest Liszt Ferenc International Airport, it can be easily reached by public transportation from Budapest downtown and by car as well. Public transport in the city is well organized. The venue can be reached by the blue metro line M3. You should get off at Kalvin tér. You can travel in the vehicles only with pre-purchased tickets or passes that you validate when starting your trip. Tickets are valid on the entire length of bus, tram, trolley bus lines, metro lines, the Millennium Underground and the cogwheel railway, but are only valid on suburban railway (HÉV) lines within the administrative boundary of Budapest. Tickets can be purchased at metro stations, at news-stands and at ticket vending machines. “The whole city in your pocket.” is the motto of the Budapest Card.